BIG THUMBS UP TO THE SCDF RESPONDING OFFICERS! If it were me, would the SCDF team arrive so quickly? Would they attend to me that efficiently and commendably? Would everything that could be done to save my life be done the way it was done for Heng? 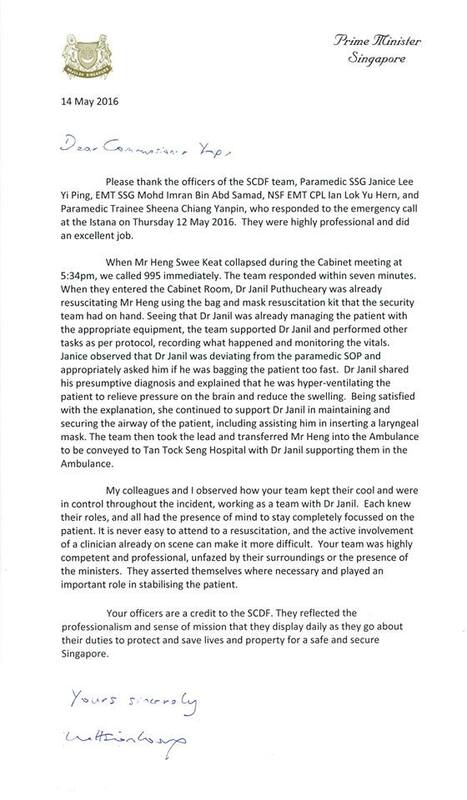 And lastly, would PM write a commendation like this on my behalf to SCDF? Sorry, I was just daydreaming...because I am none. I think it depends on your luck more than anything else. Note that the team was dispatched from the central fire station which is very near to the Istana. Well then, I am out of luck as I am in Punggol and the team will probably take 7 hrs instead of 7 mins. to reach me.